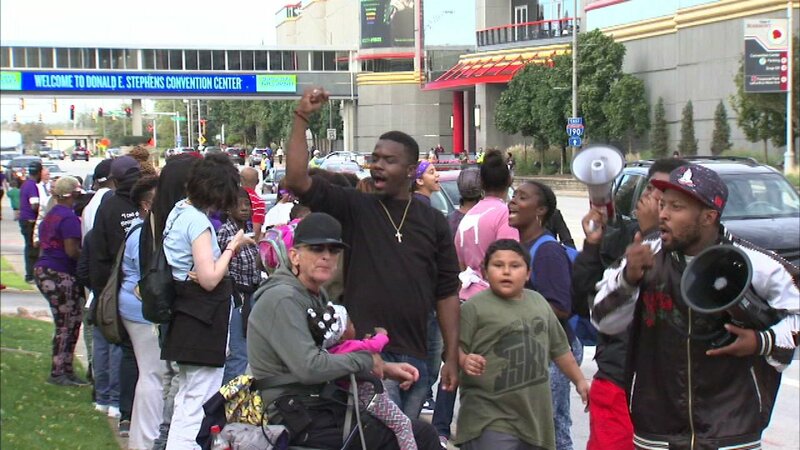 ROSEMONT, Ill. (WLS) -- Supporters of Kenneka Jenkins protested the Rosemont Police Department's decision to close the case into the teen's death on Saturday. The group gathered outside the Crowne Plaza Hotel in Rosemont where Jenkins was found dead in a freezer last month. Police released surveillance video footage that showed Jenkins walking alone through the kitchen near the freezer. Police have ruled her death an accident, but some supporters think she was a victim of foul play. Jenkins was attending a party at the hotel and was seen staggering through the hallways before she disappeared. Rosemont Police announced Friday that they have closed the investigation into the death of Kenneka Jenkins, who was found dead in a hotel freezer in northwest suburban Rosemont in early September. Rosemont's police chief said in part, "What we have reported throughout the investigation and again today are the facts. At this time, the Rosemont Public Safety Department has closed the death investigation of Kenneka Jenkins and has classified this incident as an accidental death." Jenkins was last seen in the early hours of Sept. 9 at a party on the ninth floor of the Crown Plaza Hotel and was reported missing that afternoon. Police found her body inside a hotel freezer shortly after midnight on Sept. 10. Surveillance footage from the hotel showed Jenkins stumbling out of a first floor elevator, eventually making her way to the kitchen. In more than 30 hours of surveillance video provided by Rosemont police and reviewed by ABC7 Eyewitness News, you never see her going into the freezer. Police said her body was found in a walk-in freezer that was inside a walk-in cooler inside an unused and vacant kitchen. Police said the freezer Jenkins was found in was on and fully operational at the time her body was found. Police also said she was found with the freezer's lights off, but that the lights and also the freezer's safety device were fully operational at the time of her death. The Cook County medical examiner ruled Jenkins' death an accident. She died of hypothermia, the medical examiner said, with alcohol and topiramate intoxication - a prescription drug used to treat epilepsy and migraines - as significant contributing factors. Police said they have not found any evidence to contradict the medical examiner's findings. "Our detectives reported no signs of foul play throughout the whole investigation. There is no evidence that Ms. Jenkins was forced to drink alcohol or consume any narcotics while at the hotel. The majority of people at the party included close friends and even relatives of Ms. Jenkins," police said in their statement. Along with the statement, police released files from the investigation including photos of the crime scene and Jenkins' body. Jenkins family released a statement Thursday night through their attorney saying police showed them the photos and that they thought they raised more questions about her death. The medical examiner found no signs of physical trauma or sexual assault in his autopsy. In the days and weeks after her death, Twitter and Facebook were flooded with conspiracy theories about how Jenkins died.